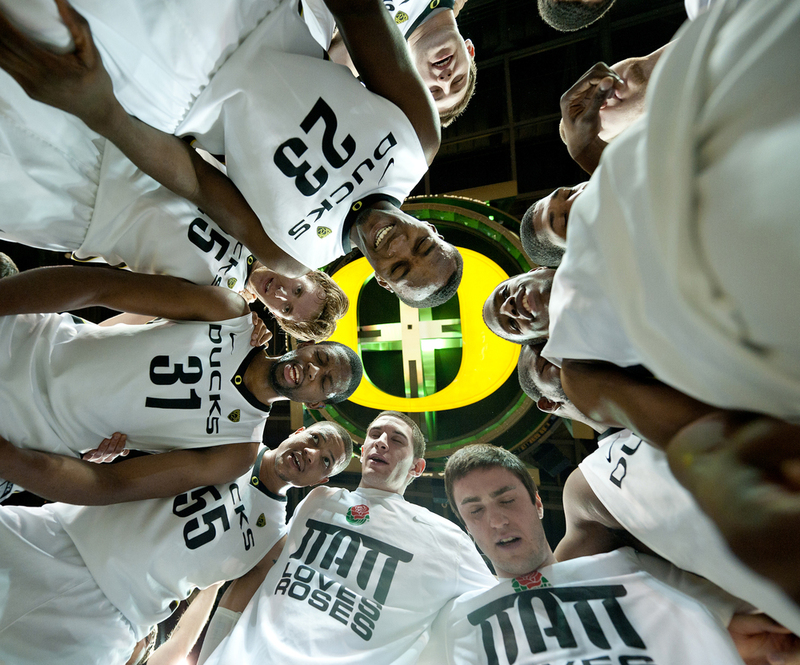 EUGENE, OR – The Oregon Ducks gather in the center of the Matthew Knight Arena court for a post game celebration huddle following their 75-68 victory over the Bruins on Saturday, January 21, 2012. BEIJING, CHINA – Cameron Raidy, 18, of Pasadena, California plays with a young Chinese student with a cochlear implant at a school for the deaf in March 2009. SEATTLE, WA – A fan attempts to distract Sophomore forward Tyler Honeycutt during an inbound play at Bank of America Arena on Thursday, March 3, 2011. 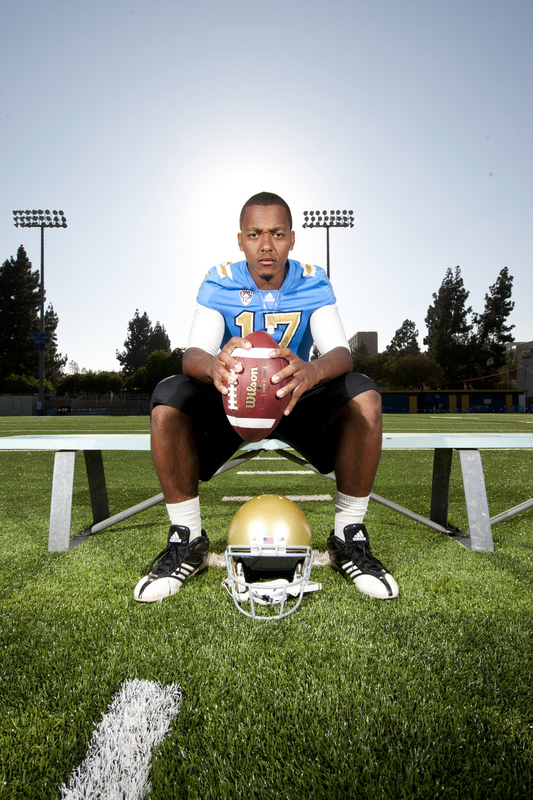 LOS ANGELES, CA – Redshirt freshman quarterback Brett Hundley at Spaulding Field in August 2012. LOS ANGELES, CA – Protesters stop at the corner of Westwood and Wilshire Boulevards before marching into the intersection, halting traffic on Thursday, November 10, 2011. HOLLYWOOD, CA – British artist Jay Sean performs his 2009 hit “Do You Remember” at the House of Blues on Tuesday, September 20, 2011. AUSTIN, TX – Sophomore guard Norman Powell sits with his face in his hands in the locker room after the Bruins were eliminated from the NCAA Tournament in the second round at the Frank Erwin Center on Friday, March 22, 2013. LOS ANGELES, CA – Senior libero/outside hitter Bojana Todorovic at Pardee Gymnasium in November 2012. BEIJING, CHINA – A tofu maker in the rural outskirts of Beijing readies a batch of tofu in March 2009. LOS ANGELES, CA – Freshman Danusia Francis performs on beam at the NCAA Gymnastics Team Finals at Pauley Pavilion on Saturday, April 20, 2013. LOS ANGELES, CA – A photo illustration for a science and health story about how integrative medicine can help boost daily energy in May 2010. LOS ANGELES, CA – Students gather around a candle and share a moment in remembrance of John Wooden outside Ronald Reagan UCLA Medical Center on Friday, June 4, 2010. LOS ANGELES, CA – Senior guard Lazeric Jones (left) and junior forward Brendan Lane (right) help sophomore center Joshua Smith back to his feet after Smith was fouled to the ground by Eastern Washington senior forward Cliff Ederaine at the Los Angeles Sports Arena on Wednesday, December 14, 2011. BEIJING, CHINA – The Great Wall in March 2009. LOS ANGELES, CA – Sophomore attacker David Culpan (left) and freshman utility Danny McClintick react to their loss to the USC Trojans in the NCAA title game at McDonald's Swim Stadium on Sunday, December 2, 2012. ​PASADENA, CA – Redshirt freshman quarterback Brett Hundley dives toward the endzone past Arizona sophomore linebacker Hank Hobson (center) and sophomore safety Jared Tevis at the Rose Bowl on Saturday, November 3, 2012. LOS ANGELES, CA – First-year mechanical engineering student Matthew Friedman, left, and fourth-year Spanish and global studies student Steven Sterrett in Rieber Terrace in January 2012. The two started the first-ever Disney Club at UCLA. LOS ANGELES, CA – Redshirt junior forward Travis Wear blocks a layup by Cal Bears sophomore forward Christian Behrens at Pauley Pavilion on Thursday, January 3, 2013. LOS ANGELES, CA – Mathew Sandoval, a fifth-year graduate student in the world arts and cultures department, sits peacefully in the center of the intersection of Westwood and Wilshire Boulevards on Thursday, November 10, 2011.